Join Art Therapist Sheilagh McGreal in the Arts Division for a creative workshop to promote positive thinking and wellness by making a Serenity Doll! Experience art-making from a therapeutic perspective to create positive intentions and learn how art can foster growth and healing. Using a variety of materials, individuals will design and create their own Wisdom Doll which can be symbolic of hope, strength, and growth. 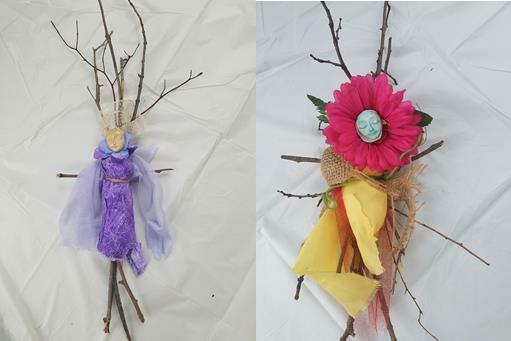 Using twigs and other natural elements to create these dolls they create a feeling of calmness and joy in your home. Sheilagh will bring twigs, fabric, beads, embroidery thread, tree moss, as well as many other supplies. If you want to personalize your doll you can also bring your own embellishments.There is no previous art skill needed for this class, just a desire to create! There will be no admittance to Art programs after 15 minutes past the start time. Late arrivals interrupt the teacher’s instruction and the flow of the class. Thank you for your understanding.